The Easy Street Family Fun Center has so many fun things to do for families! There is the Arcade, the Kid Works climbing play structure, Go Karts, Batting Cages, Water Wars, a Rock Climbing Wall, and Miniature Golf! This would be the perfect spot for a birthday celebration,or a group or club event. One thing I noticed when I first walked in, is that it was very clean. It had a very nice fresh clean scent and made a very nice first impression. It was very nicely maintained. We had a very fun visit! Bryan's favorite thing to do was the Go Karts, he loves going fast! He loved to watch the Water Wars water balloon competition, and he even got splashed! The Miniature Golf course is very beautiful, well groomed, and elaborate with water falls, rivers, and even a pretend crashed airplane! This entertainment center has a full service snack bar with pizza, burgers, buffalo chicken strips, hot dogs, fries, nachos, corn dogs, hot pretzels, cookies and more! They have real ice cream, and huge sundaes, the best ice cream parlor in Ocala. Prices were very reasonable I thought, and the staff was very friendly. The games give out tickets that can be redeemed at the ticket redemption center, with lots of neat prizes to choose from. 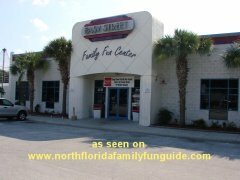 This is the best family fun entertainment indoor facility in Ocala! Easy Street Family Fun Center ONLINE COUPONS!